The complete content of this site including text, graphics, logos, button icons, images, and software code is the property of The Arabian Jockey Club, the owner of arabianracing.org, or its content suppliers and protected by U.S. and international copyright laws. The collection, arrangement and assembly of all of the content on this site, and the software developed for this site and used on this site is the exclusive property of The Arabian Jockey Club and protected by U.S. and international copyright laws. 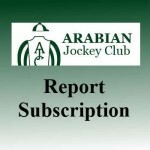 Any use, except as used by visitors to the site, including the copying, republishing, modification, distribution, transmission, republication, downloading, or display of the content on this web site is strictly prohibited without the prior written consent of The Arabian Jockey Club.